29 Mar It’s Time to Celebrate Spring! We are in the last week of March and I must admit, I couldn’t be happier to see April peaking around the corner. What a crazy month it’s been! It’s still colder than I wish it would be, but, here in CT, we take what nice days we can get and when they arrive, we CELEBRATE! Despite the chilly nights, there are clear signs of spring all around us. The birds are singing very loudly. Yesterday I heard a raucous chorus of frogs in a nearby inland wetlands. I have so much in bloom- Hellebores, crocus, Iris reticulata, and witch hazels continue to welcome the early days of this special season. If you go out and work in your garden beds, you will see perennials coming to life, buds swelling on trees and shrubs, and hopeful surprises everywhere. Here at Natureworks, we are OPEN and filled with lots and lots of beautiful flowering plants. 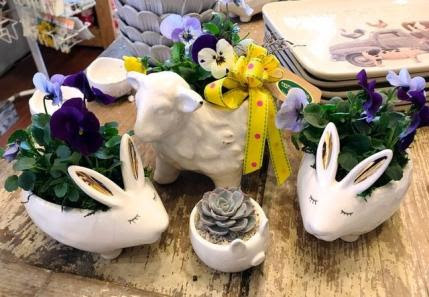 We continue to create planters and Easter basket garden arrangements every day. The big question is- can you put them outside? 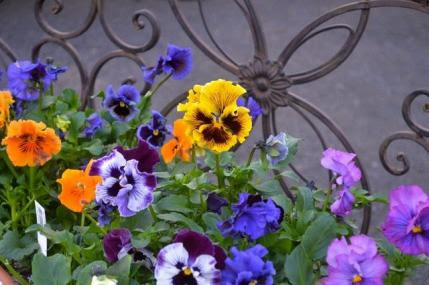 As long as the nights are in the high 20’s, the only things I would leave out overnight are pansies and violas. They can take it down to 24 degrees. Everything else should be brought in at night, even into the garage. 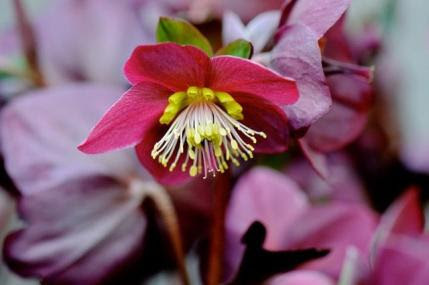 We are planting cool season lovers- primroses, bulbs, Ranunculus, Iceland poppies, Lewisia, Hellebores, and Dianthus top the list. The weather looks like it’s going to moderate as the week progresses. That will make all of us VERY happy, people andplants! We LOVE our native bees! 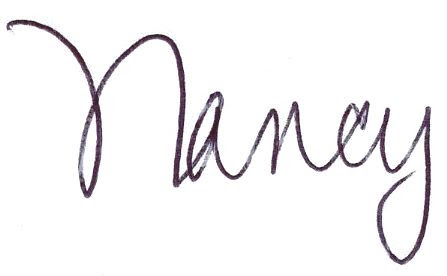 about this? 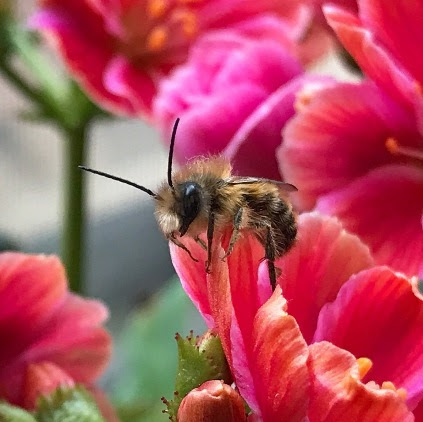 Native bees are so vital for pollination. 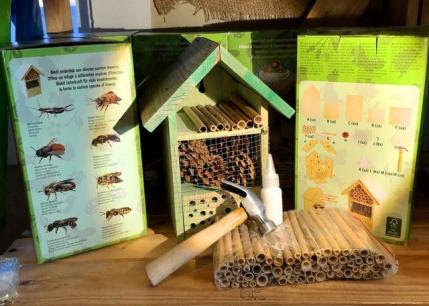 Mason bees, especially, fly much earlier and in much colder weather than most bees. I have been on the road, giving talks about this, all winter long. In fact, I am almost ready to put our new Native Pollinator page up on our website. Check out the newborn on the left, what a cutie! A very important category of plants that pollinators and beneficial insects love are herbs. This week I have spoken twice on Blended Gardens, explaining why flowers and edibles belong together. I focused on dill, fennel, lovage, mountain mint, bee balm, borage, coriander, and other common herbs as sources of pollen and nectar for many native bees and wasps. 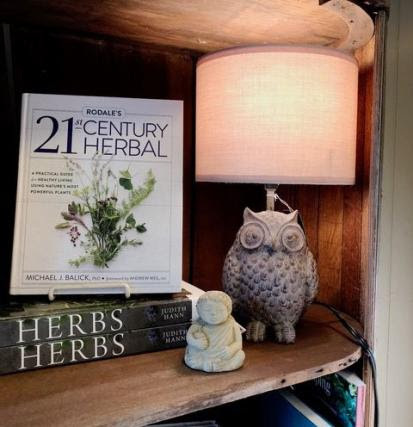 This year we will be focusing a lot on herbs at Natureworks. My friend, seed expert, and serious herbalist Sandy Merrill has agreed to join me in this effort. Stay tuned! We just keep planting up the cutest gifts! What we have changes every day, actually every hour. Hop on in! Check out our new umbrellas! I am sure you know someone who needs a chicken or cow umbrella in their life, don’t you? One of the best things going on at Natureworks this week is that we have the coolest gifts for kids that do NOT involve sugar! 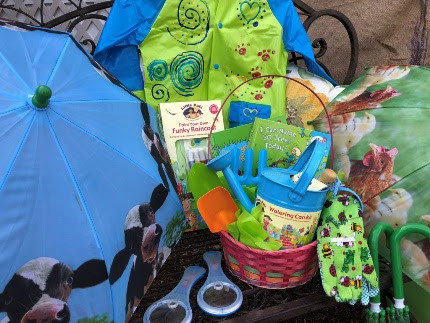 Why not fill an Easter basket with books about nature, a “paint-your-own-raincoat” kit, children’s gardening tools, seed packets, a magnifying glass, watering can, and other fun items that will entice your children or grandchildren to join you outside in the garden? You can pre-sprout your pea seeds to get a jump on the planting season. Soil must be 45 degrees or warmer before planting them outside. We’ve got the best organic seed starting supplies! tomatoes, peppers, eggplants, tomatillos, and other warm season vegetables indoors. 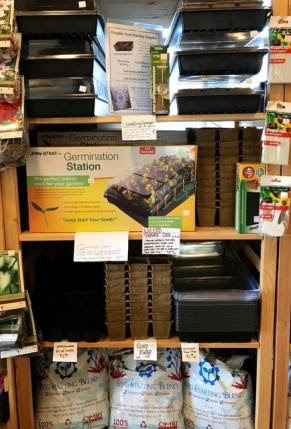 We have all of the organic seed starting supplies you need including our Germination Station that comes complete with a heat mat, seed starting tray, and greenhouse dome. And, of course, we’ve got the SEEDS! Stock up now on peas- sugar snaps, shell peas, snow peas, and even flowering sweet peas. Since we couldn’t plant them on St. Patrick’s Day due to the giant snowstorms, we are waiting for the soil to warm up. I have a bed ready and will be using my soil thermometer to make sure the soil is 45 degrees or above before I plant them. Placing black plastic over your bed will help move this process along. 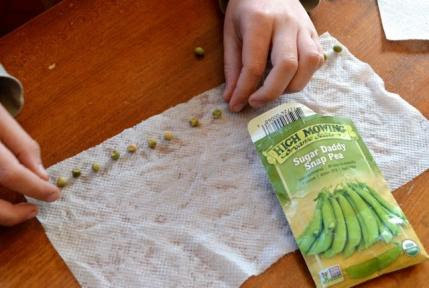 You can also pre-sprout your seeds in moist paper towels which will give them a head start once the soil comes up to temperature. 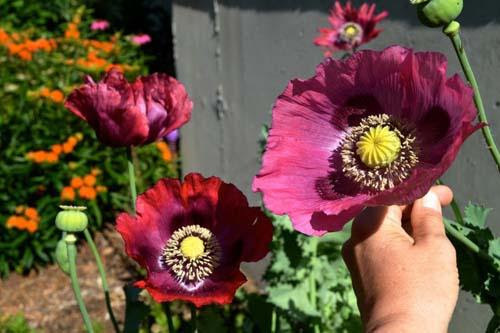 And then there are the breadseed poppies! Mother Nature continues to give us a window for poppy seed sprinkling as long as the ground is cold. And we still have many varieties of poppy seeds! Check out our first Facebook Livevideo that we did last week on this topic. Everyone was so excited to see a video from us. YES, you simply sprinkle them on top of cold soil. Don’t cover them. Sow them as thinly as you can. Don’t weed ANYTHING you don’t recognize and once the blue-green, ruffled leaves appear, thin them to get the biggest flowers. The video even showed you how to harvest and save the seed for next year. Lenten Roses (Hellebores) are the ideal Easter gift. They are a hardy perennial that blooms…wait for it… NOW! They will come back and flower every March. Tune in this Thursday at 5 for our next episode of Facebook Live. This week we will be talking about cool-season crops- vegetables, flowers, and herbs- that you can plant directly in the garden in April. We are starting to get word that our organic veggie seedlings are ready. We are waiting one more week to start offering lettuce, broccoli, and many more. Get your row covers ready, clean out your cold frames, outdoor veggie planting time is almost here for the cool season crops! So it’s time to get your spring on and hop into Natureworks for some inspiration. 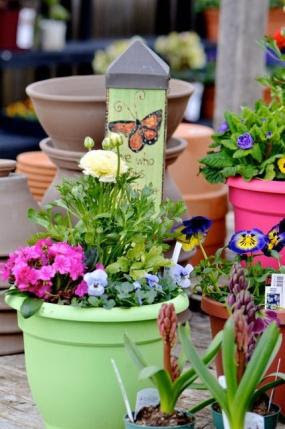 Unique gifts, flowering plants, pretty planters, Easter garden baskets, seeds galore, and lots of fun surprises await you. We are closed on Easter Sunday for family time before the spring rush really kicks in, so plan to shop early. I hope to see you this week!